There was a long standing issue with embeddng of subforms when triggered by xforms model actions like xforms-model-construct-done and xforms-ready. This has been fixed now in the development branch of betterFORM on Github and will be effective with next release of betterFORM 5.0 (SpringBud). XForms has a MVC architecture and this it what makes it so powerful when it comes to build complex applications that reach far beyond a few fields with validation. But as applications grow there naturally comes the requirement for modularization. Models are the building blocks of an XForms application. 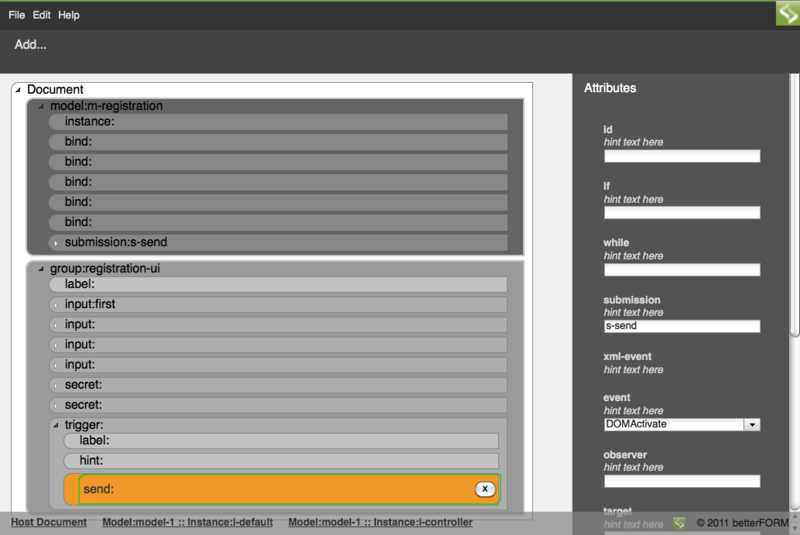 XForms already supports multiple models on one page, each with its own, encapsulated instances and constraints. But models must be able to exchange some data in order to act as a whole in a larger architecture. Sometimes this just means to pass a single or only a few values and sometimes this means to exchange whole instances. At the same time a model should enforce some kind of encapsulation as known from object-oriented languages to ensure consistency and robustness. Before discussing possible ways to enable model-to-model communication it should be mentioned that there is already a pattern to exchange instances between models. As two models existing in a page can perfectly use the same instance URI to load and submit data it’s already possible to ‘share’ those. But first this comes to the price of serializing the data as XML and re-parsing them when loading into the other model. Second – there will be two (detached) copies of the same instance – one in each model that need to be synchronized with each other. Though XForms is not a new technology there are no established patterns for data-exchange between models. The following paragraphs are based upon our experiences with this topic. Though the need has existed before the upcoming of subforms has made the need for some kind of data-exchange more urgent as for maximum re-use of subforms (which can be full-fledged standalone forms in other contexts) you’ll likely want your models to be as independent and loosely coupled as possible. The following paragraphs present some approaches we found during our project work over time. It should be noted that these techniques are custom betterFORM extensions to the standard but equivalents might be found in other XForms implementations. If complete instances or larger parts of them need to be shared between models a cross-model submission is the right answer. An example might an address model that shall be re-used within a larger context that also needs the address instance data structure for incorporation into one of its instances. Here the ‘get’ method is used to read the previously stored instance from the map and replace instance ‘another’ with it. For safety the submissionhandler is consuming which means that the instance will be deleted automatically from the ‘context’ hashmap once it has been read. This kind of submission is especially useful in conjunction with subforms – if you are using multiple subforms e.g. in a wizard and you want to pass instance data from one subform to another the context hashmap is the right way to do it. Form A might already have been destroyed when loading form B but the instance data can survive within the context hashmap and be used in the next step of the wizard. Another advantage of cross-model submissions is that one model can re-use the validation constraints and logic of another without breaking the encapsulation between the models as data exit and enter a model through its interface – the submission module. As the data are exchanged directly between models within a single instance of an XForms processor its reasonably safe to rely on validations done by a foreign model without duplicating binding constraints in both models. If there are only a few values to be passed the instanceOfModel(modelId, instanceId) function is a way to do this. It takes two params – the id of a model and the id of an instance within that model. In this case the value of the XPath ‘foo/bar’ in the ‘default’ instance of ‘modelB’ will be set to the node ‘baz’ in the instance ‘default’ of ‘modelA’. Easy enough but this function also is somewhat dangerous as users might expect this function to work in any context. E.g. they might expect that instanceOfModel can also be used on bind elements. But this would create inter-model dependencies which is not a healthy thing to do. The XForms dependency engine was designed to efficiently handle dependencies within one model but not to create dependencies between models. Ignoring this could cause serious consequences for the consistency of data. For this reason this function should be used with caution. As long as its used in conjunction with the setvalue action everything should be fine but you shouldn’t use it within a model. Therefore if in doubt the method proposed in the next section should be preferred. Dispatching a custom event with contextinfo is a less intrusive way of passing values between models than the instanceOfModel() function (and avoids its dangers). It uses the ability of XML Events to carry context information along with the actual event. A small addition to the standard XForms dispatch action allows you to specify custom parameters for a event and pass a set of values to a target in another model. As always an example illustrates this best. Somewhere within the scope of model ‘A’ a dispatch action is fired. It passes two params as contextinfo to the event. The first one is a static string while the second (someXPath) pulls a value from an instance in model ‘A’. Somewhere in the scope of Model ‘B’ a handler for ‘customEvent’ is defined and can access the passed params with the standard XForms event() function. – That easy. Though this method uses a bit more markup than the instanceOfModel approach it avoids its dangers. As it passes data by value and not by reference it honors the encapsulation of models. This article was intended to show some alternatives for the model-to-model communication in XForms. However it is assumed that this is not the end of the discussion and other ways will be invented and hopefully be standardized in future version of XForms. As always comments and suggestions are more than welcome. In previous versions of betterFORM event logging was available on the Firebug console (or its respective counterparts in Chrome and Safari). However this worked only for the uncompressed version of betterFORM as it relied on the console.debug feature of those tools. When active there will be a small icon in the upper right of the browser window. Clicking on that will reveal the event log. In the event log each event that is received from the server will be listed with all of its context information. In some cases where an targetElement or targetId is given you can click on a link and the respective element in the browser will be highlighted in blue. The icon in the upper right will allow to expand or collapse the event log while the trash bin icon allows to remove all entries from the log. 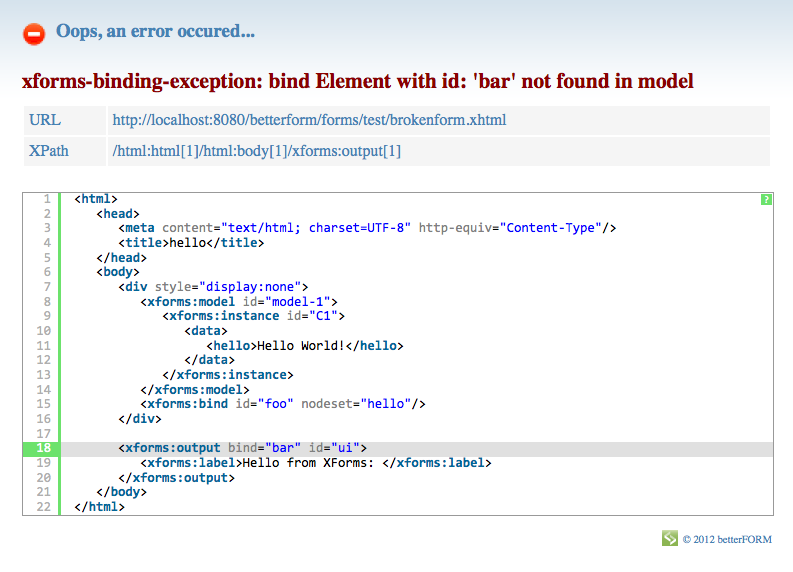 One of the most common errors when authoring forms is to produce a xforms-binding-exception. In complex forms these can be hard to locate. The new error highlighting feature improves this by giving you the exact line in your markup where your binding exception occurs. In addition to the markup the requested URL and the exact XPath for the problematic element is shown. The toaster position now can be any of the four corners of the browser window. Valid values for the attribute ‘bf:toaster-position’ are documented in the Dojo docs. Not strictly a new feature but we have started to automate cross-browser testing by using the new Selenium webdriver. We have already implemented a lot of tests which are now run twice a day to reveal potential regression bugs. The test assertions will be expressed in an XML format to ease the implementation of tests. From these definitions the Java code for Selenium will be generated. The tests may then be run against different browsers. We will continue to add tests and probably make the testing infrastructure available for developers that like to do their own tests. LESS has a growing popularity for doing complex CSS layouts. Check out their website for an overview of the features. We decided to move all relevant CSS stylesheets to LESS as it is much more expressive than CSS and e.g. allows variables to avoid redundancies. LESS files get compiled into standard CSS so there are new dependencies at runtime nor restrictions on the use of ‘normal’ CSS files. Starting with RC 2 there will be a new XForms editor in betterFORM. It will be (not in the first place) wysiwyg page editor but a pure XForms 1.1 editor which allows to edit all XForms markup contained in some (X)HTML document. It focusses on the abstract view of XForms authoring and assists to keep your markup clean and consistent. Large parts of the editor are generated directly from the XForms 1.1 schema thus supporting the full set of XForms elements and attributes plus the XML Events schema. The first version will give access to the complete XForms language vocabulary unfiltered and will mainly target more experienced XForms authors. Starting from there ‘profiles’ will allow to filter and change the representation of the attribute editors and add authoring convenience functions. After ‘expert mode’ (above) a ‘basic mode’ is planned as an alternative view for non-XForms users. This will works with implicit instances (instance nodes created on the fly) and smart defaults for quick editing without all the rarely used features. parsing of any XHTML/XForms document and opening it in the editor. Only XForms markup will be shown. We hope to create a tool for XForms authors to create fully valid XForms documents and appreciate all comments and suggestions. Contributors welcome. To simplify the setup of projects using betterFORM XRX there’s a new helper build tool called ‘ProjectAssistant’. It helps to keep your project sources separate from the betterFORM sources while still giving access to the full functionality of the complete source tree. It also allows to easily switch to a newer version of betterFORM as soon as it becomes available. There is a new Windows installer packaged as an .exe file to make installation for Windows users even easier. A new resource handler allows to turn caching on and off. We are very happy to announce that we now have a tight cooperation with the eXist project and directly commit the XRX extension to the eXist trunk. However we will continue to offer our own eXist/betterFORM bundle as a ready-made installer packed with the latest stable version of eXist. One hotspot of our activities was to refine the eXist integration and to fix the issues that existed in the former release. There were some inconsistencies and shortcomings of that release and we think we have finally sorted those out. Configuration and installation should now be smooth. We also concentrated on making the betterFORM extension a good starting point for building XRX applications that are stored completely in the database. There also will be a browsing tool that lets you browse, execute and view the sources of all of your app files. Additionally you can upload files to the database and create new collections as needed. Dashboard supports the XML application developer and XForms author in working with their resources. It lets you browse the hierarchical structure of your applications, create new collections, upload files and view the source-code. 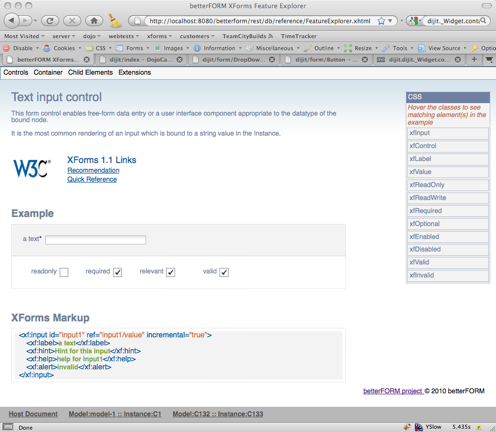 It will also allow to start the XForms editor with an additional button. Dojo 1.6 is now integrated. All Dojo themes (tundra, soria, nihil and claro) can now be used in the forms. AVTs are now fully supported on foreign elements (typically HTML). That means you can use XPath expression in any HTML attribute for instance will evaluate the XPath according to the XForms in-scope context rules allowing you to manipulate the rendering of HTML from XForms. a submission @replace=”new” allows to open the result of a submission in a new window. 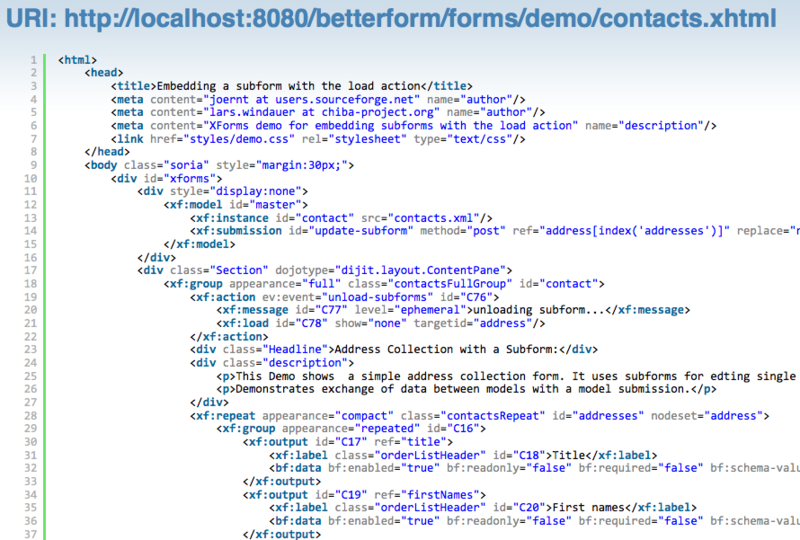 Please note that this functionality has been accepted by the XForms WG as a new feature though with a different syntax. We’ll adapt to that syntax in a later release. Typical use case is the display of printable views. The Java classes implementing the XPath functions for XForms have substantially been refactored for easier extensibility. This is an important preparation for allowing users again to configure a new Java function library. There is a new connector with the scheme ‘context:’ that allows to store an instance into a hashmap of the XForms processor. This is a handy feature when composing wizard-style forms that are made of subforms and need to pass instance data back and forth. As the same XForms processor instance will be used over the live-time of the embedding document this can act as a global data-container for subforms. SSL handling has been refined allowing a pluggable SocketFactory to be used. Details of the keystore can be configured in betterform-config and a howto has been added to the docs. A control now may have multiple labels for different languages. This gives an easy alternative for quickly internationalizing forms. It’s planned to extend that approach for alerts. The amount of events propagated to the client have been reduced dramatically. From now on only events that really have been used in a form will be propagated over the net. The new solution still requires that you activate the ‘debug’ feature in the betterform-config.xml but is now independent of Firefox and Firebug. Once activated a bar is rendered at the bottom containing one link to see the host DOM as it exists on the server (pre-transform) as well as one link for each instance in each model. The links update if a model becomes available by embedding or is removed from the document by unloading. The XForms inspector can now be collapsed to an icon to avoid hiding elements on the page. we now implement the proposal for the dialog element along with its show and hide actions. There is a new XFormsPostServlet to allow initialization of a XForms from a http POST containing xforms markup in the body. 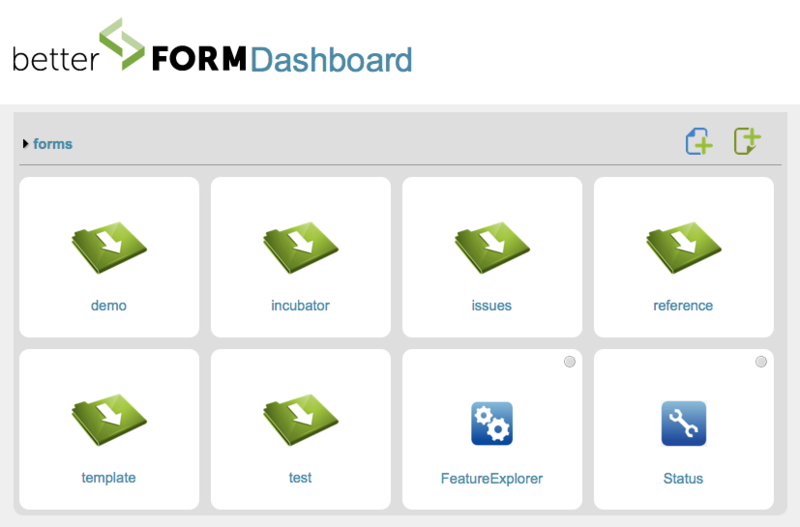 The XForms Feature Explorer serves as a live reference for XForms and betterFORM. It has been completely overhauled and given a clean structure with description (with spec links), live example and source code. Alongside of that you will see which CSS classes that apply in the respective context and can even see them at work when hovering the class name. New sample forms have been added beyond the basic control and container documentation. CSS style rules that are present in a document that is embedded will now get imported into the embedding document. Currently only style elements are handled but this still allows usage of external CSS files by using the @import instruction. The betterform-config.xml now allows to configure a new user agent along with its supporting Java class and a XSLT transform. The handling of resource pathes has been simplified. Instead of having multiple pathes for CSS, scripts etc. there’s now only one for the resource root dir which is configurable in betterform-config.xml. The XPath processor is now using Saxon 9.2.1.5. The http client has been upgraded to latest version of HttpComponents (formely Apache Commons HttpClient). Java code level logging has been refined in many areas now giving you more fine-grained control on the level of detail you’d like to log. Instead of just ‘debug’ we are now making use of the ‘trace’ level which produces much better readable output. Each control may now have an additional delay for the firing of incremental events. If delay is 0 there will be one event for each keypress while a control has focus. A bigger value will defer the firing for the specified time in milliseconds. The default behavior for alerts and hints has been reworked. As the default now inline alerts and hints will be used. Hints will show when a control gets focus. Whenever a control gets invalid the alert will show in the same place as the hint (covering it). Alerts can be closed by clicking on them in case they cover other fields in a complex layout. The CSS for these child elements has been stabilized and works with horizontal and vertical layouts. There’s a new date control consisting of three dropdown controls instead of the datepicker popup. The XSLT stylesheets responsible for the transformation from XForms to HTML have been completely overhauled for easier maintainability and extensibility. The base stylesheet now again produces native controls which can be overwritten to add functionality like scripting. As a result the overall stylesheets are more modular, smaller and easier to enhance. a hard-to-catch race condition with the ajax calls was fixed that only shows under heavy test conditions. Now the client-side uses a fifo buffer to make sure all events are processed in right order and even is able to discard events that may have become irrelevant in the meantime through network delays. some issues regarding focus events (especially group and repeat focus events) have been addressed. Besides the above dozens of smaller issues have been addressed. For a detailed list please visit https://betterform.de/trac/query?status=closed&milestone=limeGreen+RC4&group=status&order=priority or check the commit history on Github.